Well, we can’t say we saw this one coming. 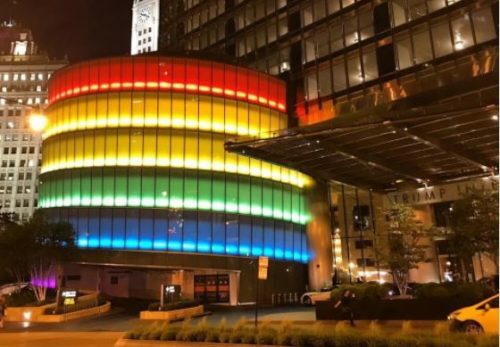 The Trump International Hotel & Tower in Chicago was lit up in rainbow colors, seemingly in celebration of Chicago Pride this weekend. Joe Jervis, at Joe My God, looked into the situation, and after several attempts at getting a statement from the hotel got exactly nowhere. “We’ve been told not to say anything until the PR person puts out a statement,” a person in the hotel’s marketing department told him. It is a surprising move, considering President Donald Trump broke tradition by not issuing a pride month proclamation. The Trump administration is also rolling back civil rights efforts across the federal government, and has rescinded protections for transgender students. Trump obviously cares so little about those living with HIV/AIDS that six members of the Presidential Advisory Council on HIV/AIDS (PACHA) resigned in protest.